This large 4 bedroom, 4 en-suite bathroom house is in a great location in Huay Yai. Just 10 minutes to the beach. This property is divided so there are 2 living rooms, 2 European kitchens and 2 seperate carports. The 300sq.m house stands on 824sq.m of land with high perimeter walls and 2 seperate entrance gates. Fully furnished with 2 x 43\' plasma TV\'s, 5 A/C units, internet, UBC and chanote title deed transferable with Thai company. 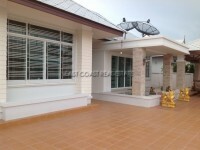 Owner will consider to rent the property at 45,000 Baht per month on a long term basis only.